This is the glorious Porsche AlienProbe sent to me for Secret Super. Its branded as a Nex model, but we all know that means its a Welly. This is the GT3 variant of the previous generation Porsche 911, the 997. This is my first 1:18 Welly, so I know next to nothing about the brand, but this one is definitely a good one to start off with. The GT3 is the track focused 911 with a stripped down interior, roll cage, bigger brakes, and obviously a big wing on the back. 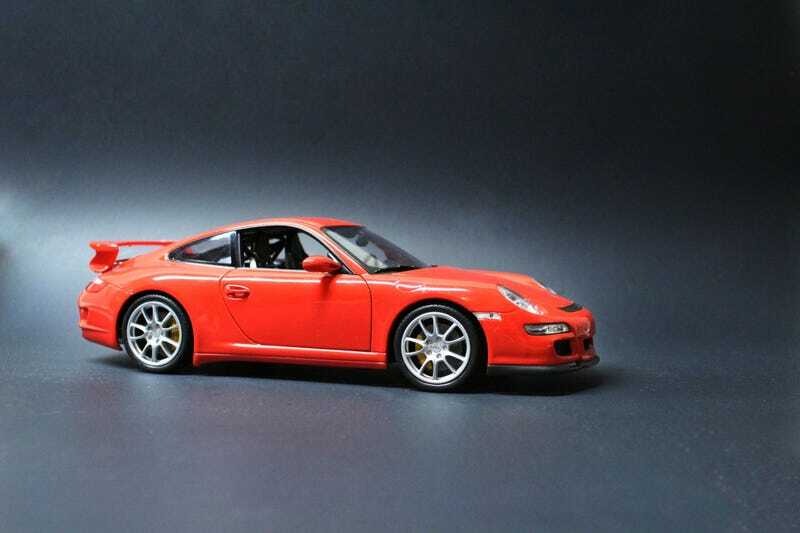 This model happens to be a 997.2, the facelifted GT3 that Porsche launched in 2009. Along with a new face, the GT3 got a bigger engine and some crazy engineering stuff that I read on Wikipedia. Only 65 of these roided up 997's made it to US shores. I’d put this model right on the same level as current Maisto’s. There’s a decent amount of detail here, and all of the proportions are on point. A little gap along the left taillight, but that’s forgivable. Under the boot in the back, we find that awesome 3.9L flat-6. Engine compartment components are painted to highlight their individuality. I was surprised at how high the deck lid opened for engine viewability. The headlights are a thing of beauty. There’s a lot of detail on the lenses and the housings pop in the light. There are even nozzles for washers present. The frunk isn’t anything to write home about. Don’t get me wrong, it looks great, but it’s all just stamped plastic. The interior is surprisingly full of features. The nav screen displays an actual map and the steering wheel was it’s center marked yellow, because racecar. GT3's mark the doorsills, as you would expect.